It's your story. Own it. If you have a question and answer that is not asked and answered on these pages, please contact us. Why are you guys so awesome? Seriously, why are you so awesome? Who is Wear My Story? What's up with your tag line? If I Share My Story on your site, can I win a FREE ring? What is the Ring Rep Challenge? Can I get my class ring for FREE? What exactly do I get with a FREE Ring? Does it cover 14k Gold with diamonds? If I earn a free ring, can I choose any style offered by Wear My Story? Do I have to limit myself to referrals from my high school only? What qualifies as a referral? What are some tips to help me succeed? Ha ha! I know how to game your system! Can't I just use my own referral link? What the heck?!? I bought my ring and didn't know about the Ring Rep program!!! Can I still get my ring for free? What if my parent bought my ring? Can they get credit for referrals and other rewards? How long can I earn credit for referrals for? Can I print off my referral link and give cards to people? Do I have to buy my class ring from Wear My Story in order to be part of the Ring Rep Challenge? Should I wait until I earn 5 referrals to buy my class ring? How many $100 gift cards can I get? Do I have a choice of gift card? When will you announce the winner of the Ring Rep Challenge? How many referrals do I need to get to win the grand prize? How long until I get my ring? Where can rings be shipped? May I pay extra for rush orders? It's been 6 weeks and no ring. What do I do? How big are the stones for each ring? Why can't Petite and Minuet rings have a LaserVue, Encrusting or Design Under Stone feature? Which rings can be ordered without a crest design? Are there any other stone options not listed on the website? Can I get the same Side Design Emblem on a Crestline ring as on a Designer ring? Do I have to order my school colors on my ring? Why can't I have more letters on my side personalization? What if I don't see my school mascot on your website? What is Silver Select with Platinum? Is 10K harder than 14K or 18K and what do most people order? What is the two-tone metal option on the Crestline rings? What is one-piece die induction and why does it make my ring better? How are the rings made? Where are the rings made? How many steps are required to make a class ring? What is the ArtCarved Lifetime Warranty? What is the ArtCarved P.A.L.S. Replacement Agreement? Where do I send the ring for repairs? How should I send the ring in for repair? Should I reorder a ring if something is wrong with it? What repairs are covered under ArtCarved's warrranty? Can I order a ring without a school name? Can I order a ring with custom wording around the stone? Can I order a ring with a back year date? 1977 for example? I need to replace a ring from years ago. 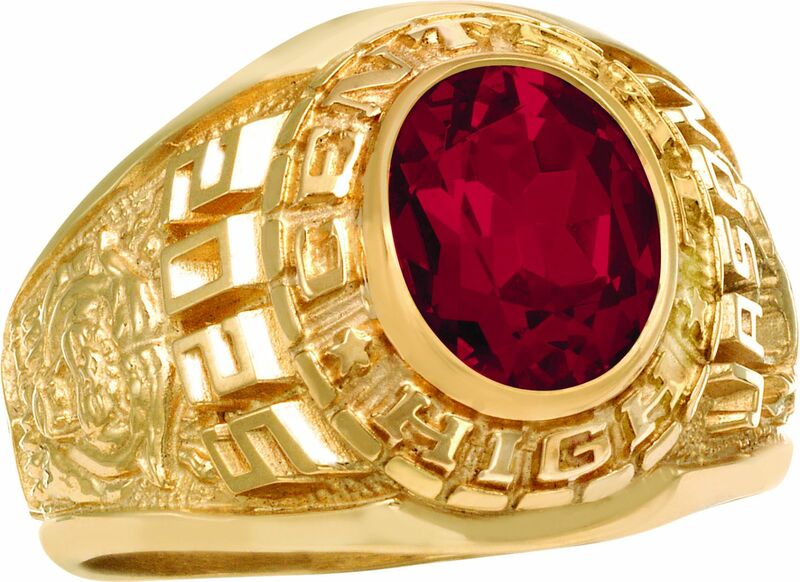 Can you supply the original ring from the year I graduated? Do you have options for home schoolers? How can I make sure I am ordering the right ring size? I don't want a class ring, but can I make money with your program? Thanks for noticing. We try not to brag though. We were taught to be humble. Thanks for asking. You can read all about us on our About Us page. Clever, right? It's pretty simple. We think story is quite possibly the most powerful thing on earth. And what's even cooler is that everyone has their own, unique story to tell. We love people and stories in general, and we think class rings are an awesome way to commemorate your individual story up until this point in your life. So, the tag line, "It's your story. Own it." is all about you grabbing hold of your own personal story and running with it. ... And yes, it works on multiple levels as a shameless plug for you to buy a ring from us. This is America, right??? Yup. We love hearing different stories because every story is unique. If you take the time to share your story on our site, we will enter you into a drawing to win your class ring for free. We're so glad you asked! It's your opportunity to Earn a FREE class ring, $1,000's in Gift Cards, and a chance to WIN $10,000!! It's super simple. When you register on our website, you get a unique referral link. Anyone who uses it gets $25 OFF on their ring. Tweet it, Facebook it, email it, make a t-shirt out of it, buy yourself a label maker, smoke signals ... er ... , you get the idea. However you want to do it, it's up to you. Every time someone buys from your link, you get $40 off your ring. Win-Win. Get only 5 referrals, and you get a FREE ring! Yes. Just sign up for our Ring Rep Challenge, and you're on your way. Uhhh, yeah. We know. It's awesome. Sorry, no. A free ring is equivalent to a $200 credit you can apply towards any ring purchase on our site. If your ring costs more than $200, you pay the difference. Yes, you can choose any style. However, the credit limit you can apply towards your ring is $200. That amount will cover the entire cost of most Siladium rings on our site. No. In fact, we encourage you to get creative and find ways to earn referrals from people all over the country! It’s your ingenuity and creativity of how you use your referral link that will help you climb to the top of the Leaderboard. If anyone uses your link to come to our site and makes a purchase over $125, you are credited with the referral (stacking rings will NOT count unless total purchase is over $125). As long as a referral creates an account on the site, that person's purchase is linked to your referral link. So, they can create an account and come back later and buy. You'll still get the referral. Find people who are already interested in buying a class ring - both in your school and online. Let them know they get a $25 discount when they buy from you. Make sure they know our low online prices beat those of in school sales. And, we partner with Commemorative Brands Inc. and their line of Artcarved rings. When your class rep from shows up at your school, take notes on who goes and talks to him or her. Then, follow up with your referral link to those people. Share your link with all your friends via Facebook, Twitter, email or other social mediums. Focus on the $10,000. That's a highly motivating number. Find forums and discount sites online and share your referral link. Create a blog or your own website and market it. As soon as you can, buy your own ring and wear it. Showing off your own bling could yield some valuable referrals. Let your parents know about the contest. They'll be interested to help if it saves them money. Be nice. It goes a long way. Well, yes smart guy. Technically, you can. You will have to create a 2nd account at checkout to get the $25 off. Your first account will get credited with $40 for the referral, but you'll then have to buy a 2nd ring to use that $40 credit. Sooo .... it kind of defeats the purpose. We recommend getting referrals first so you can get a bigger discount. And if you use that 2nd account to get your referrals, you get a choice to choose either your $25 discount or your referral discount (max of $200) at checkout. And just for the record, don't be a jerk. We're trying to help you out here and nobody likes jerks. First of all, chill. Breathe. Maybe, enjoy a refreshing beverage. We've considered this possibility, and want to make sure you can get in on the action. Your already have what you need. When you bought your ring, our site also created a unique link for you to use as a Ring Rep. All the same rules apply. 5 referrals gets you $200 worth of credit for your account. Every set of 10 referrals gets you a $100 gift card. And, you're eligible for the $10,000 reward. Will we refund your ring purchase with the credit you earn for your referrals? Sorry, no. But, we're not stopping you from working out a deal with someone else. Hint: Use your haggling skills and work out a deal where they can use the credit from your account. Hey, we're trying to be generous here, but refunds would create a logistical nightmare for us. Sorry, we're not UPS. All other Ring Rep rules apply to your parents. If they want to work the Ring Rep program, they are welcome to. But, are you really going to let them beat you and win that $10K??? You can earn credit for the Ring Rep Challenge until the end of the Challenge period, which is June 30, 2016. However, if you plan to earn a free ring for your self, you will need to earn the five referrals required before your full $200 credit is earned. For complete details, please review our Ring Rep Terms & Conditions at wearmystory.com/ring-rep-terms. Absolutely. You can distribute your link any way you would like - business cards, t-shirts, hot air balloon. However, one distinct advantage of having a link as your referral code is that you can share it anywhere online where people would be interested in receiving a discount for their class ring. No—no purchase is necessary to enter or win the Ring Rep Challenge. And, purchasing does not improve your chances of winning. If you want a free ring, than yes. But you do earn a $40 credit in your account starting with your first referral. So, don't be afraid that you can't get all 5 referrals. Pro Tip: We've observed that buying and wearing your class ring goes a long way towards your friends wanting one for themselves. Good news! There's no limit!! Once you hit 10 paid referrals you earn a $100 gift card, and you earn one for each 10 incremental group of referrals after that. We'll give you some options to choose from (Amazon, iTunes, Starbucks, etc.) and you can choose. You'll receive the gift card from us in the mail. On July 9, 2017, the participant with the most number of Referrals obtained during the Challenge Period will be declared the Contest Winner. The Contest Winner will be announced by Thursday, August 9, 2017. To see complete Rules, please go to wearmystory.com/ring-rep-terms. That will totally depend on how much game the other Ring Reps bring to the table. The winner will be the participant with the most number of Referrals obtained during the Challenge Period. To make sure you're in the running, keep thinking of ways to share your referral link. And remember, to check your status—and the status of your competition—by checking in often at the Leaderboard or on your Account Dashboard. It's hard to wait, we know. Here's the deal. Each personalized class ring requires between four to six weeks for manufacturing. The shipping method you choose for the ring determines the delivery time. We offer Overnight delivery, 2nd Day Delivery, and Ground Delivery (3 to 7 days). As soon as the ring ships, you will receive a shipping confirmation at the email address you provided for the purchase. You can also check your shipping status on your account page. We're pleased to ship to every address in the U.S.A., Guam, Puerto Rico and Canada. We also ship to military APO & FPO addresses. Sorry, we do not ship overseas. If you live outside these areas, we recommend that you use a parcel forwarding service to receive your merchandise. Sorry, we CANNOT ship to P.O. Boxes in the U.S.A.
No. All rings require an estimated four to six weeks tme for manufacturing. In some cases rings are shipped as quickly as two weeks, but we cannot guarantee manufacturing will require less time than four weeks. Please contact us immediately by email or by phone at 1-419-777-8679 9am-5pm [Eastern Time] Monday-Friday. There are 5 different size categories total between the men's and ladies' rings. Ladies' Large (Stylist and Celebrity) 8mm x 6mm. Stylist and Celebrity measure 12mm across the widest top measurement [shank plus stone along longest axis of the stone]. Shank is 3mm at thinnest point. Ladies' Medium (Patriot) 7mm x 5mm. Ladies' Small (Petite and Minuet) 6mm x 4mm. Petite and Minuet measure 9mm across the widest top measurement [shank plus stone along longest axis of the stone]. Shank is 2mm at thinnest point. This special option is a rich 10K white or yellow gold that is deeply embedded into the top of your stone. You have the option of choosing a symbol or a personal letter. TIP: Encrustings look best on dark stones. The size of the stone [6mm x 4mm] is simply too small to view the details of the designs we offer. For this reason, LaserVue, Design Under Stone nor the Encrusting options are available. The ArtCarved Legacy and Ovation rings are available without crest designs. Sorry, No. If there is an option available, we have it for you on the site. Activities are not interchangeable between ring styles; however, in most cases you can get an side design that looks very similar. No. On Side Designs that require colors, you may select alternate colors. Just be sure to give us fairly common colors for your ring. There's a good chance that if you write in Lemon Chiffon, you're going to get yellow. Our products have been designed to provide the most attractive look possible. The letter limit ensures your ring looks great. Chances are we have your school's mascot. We have hundreds available and have posted the most popular on the site. Our artists and designers have interpreted each with bold depth and detail. If you can't find yours, just contact us, and we'll let you know if your mascot is available. Siladium® is comparable to a fine jeweler’s stainless steel. It contains 12% nickel. It polishes to a high white luster, is strong, durable and guaranteed for a lifetime. Golden Siladium® looks like yellow gold, but without the price. Another affordable alternative from ArtCarved! Available on select styles. Sterling silver is a metal that contains at least 92.5% silver. The remaining 7.5% of sterling silver is usually copper which provides additional strength. Sterling silver can tarnish over time, but it can be easily polished to its original bright white luster with a polishing cloth. Silver Select is a combination of silver, platinum and palladium. This metal combination is harder than other tarnish-resistant silver metals and more precious than Sterling Silver. It has a brilliant white luster familiar to sterling silver buyers with added strength from platinum. 24K gold is pure but too soft to use, so it is mixed with other metals to strengthen it. 18K is 75% pure. It is the European standard. 14K is the most popular choice in the U.S.; however, 10K is an affordable, beautiful alternative. White gold is the quality of 10K or 14K mixed with different metals to make it silver-colored. A dark background brings out the polished details. It is the most popular and most pictured finish in the brochure and selling guide. Black antiquing is standard for Siladium®, Golden Siladium®, Silver Select and White Gold. Brown antiquing is standard on Yellow Gold rings. Natural Finish is as beautiful as the Antique Finish, but without the dark background. This option is lovely with more subtle detailing, and is available on select styles in Silver Select, 10K, 14K and 18K gold. Natural finish is not available on the Crestline Series rings (Legacy, Heirloom, Accolade and Ovation) and other select styles as noted in this guide. The Crestline Series offers the Legacy and Heirloom styles in two-tone metals as well as all gold or all Siladium®. Siladium Two-tone is a Siladium ring with a 10K base that features the year date. A Yellow Gold Two-tone features a 10Kt, 14Kt or 18Kt Yellow Gold ring with a Siladium base. A white gold two-tone features a 10Kt or 14Kt white gold ring with a 10Kt Yellow Gold base and a Siladium Crest. ArtCarved is one of the most respected names in jewelry today. Founded in New York in 1850, ArtCarved began as a manufacturer of high-quality and uniquely styled wedding bands and engagement rings. They first entered the class ring business in 1920, bringing to it their expertise as makers of fine gold and platinum jewelry. Since that time, ArtCarved has emerged as the class ring industry innovator, bringing more new styles, features and options to high school students. Wear My Story proudly partners with ArtCarved to offer superior selection and quality for your class ring. All rings are manufactured and shipped directly from ArtCarved. By the way, we are also all about Protecting Our Planet with our jewelry. In short, they are our BFF. ArtCarved class rings are famous for their superior detailing, outstanding beauty and exceptional durability. ArtCarved introduced the one-piece die induction process to the class ring industry. One-piece die induction is a casting process which offers several benefits: rings are more durable, have a more uniform surface, and are precisely aligned and have a greater depth of detail. Stage 1: Preparation of wax model: Here a vacuum is used to force the wax into the induction die, assuring a wax ring of the finest detail. Stage 2: Preparation of the plaster mold: A plaster of paris solution is poured around the wax ring, again using a vacuum to eliminate porosity and retain fineness of detail. When this plaster mold is heated, the wax "lost." The cavity left by the wax is then ready for casting. Stage 3: Casting the metal: Here a vacuum is used to force the molten metal into all parts of the mold, creating a uniformly strong, richly detailed ring. Right here in the good ole' USA. Each high school class ring is made in Austin, TX or Denton, TX, by expert craftsmen. More than 40 hand-executed finishing steps make our class rings look lustrous and beautiful. From hand-setting each stone, to a variety of special polishing and buffeting techniques, the many painstaking finishing operations that go into every student's class ring are further demonstrations of ArtCarved's commitment to excellence. 1. Repair defects in workmanship or materials at the time of original delivery. 2. If repairs cannot be made due to defects in workmanship and materials, the product will be replaced at ArtCarved’s discretion. If the product is no longer available, it will be replaced with a product of similar design and comparable value. 3. Rings can generally be resized up to two sizes based on the condition of the ring. Any sizing that requires the ring to be remade will incur a remake charge. 4. Clean and polish the ring. 5. Genuine stones and diamonds are not covered under the warranty and will incur charges for replacement. 6. Should the year of graduation or degree change at the same school, a change to the ring will be made at no charge (limited to one occurrence for year date and within one year of the student’s graduation). A charge may apply for inside engraving changes where year date is included. No other change from the original order is permitted under the warranty. This warranty is void if work is performed on the ring by someone other than ArtCarved. If the ring is damaged or worn beyond the customer’s satisfaction, it may be exchanged for a ring of current design and comparable value at ArtCarved’s current remake charge. Shipping and handling fees will apply. If you purchased an ArtCarved's Protection Against Loss or Stolen (P.A.L.S.) Replacement Agreement, the ArtCarved high school class ring (jewelry) is protected against loss or theft for a period of four (4) years from the date of purchase. If a ring (jewelry) is lost or stolen, ArtCarved will replace the jewelry. This plan is limited to a single replacement of the original jewelry during the four year period. This P.A.L.S. Agreement excludes diamonds and Championship Rings. The P.A.L.S. agreement fee is $15.00 for non-gold rings, and $25.00 for gold rings. If your ring is lost, stolen or damaged, ArtCarved will replace the ring subject to a processing charge ($50.00 for non-gold rings, $225.00 for gold rings) based on the metal in which your ring was created. Premium stones and diamonds can be replaced at current market price. Customers are responsible for all fees, taxes, shipping and handling associated with this claim. We want your ring to be the way you want it, and in your hands. So, follow these instructions to help make the repair process as seamless as possible. 1. Please use ArtCarved’s high school ring adjustment forms (repair envelopes) which are available by calling Customer Service. By providing us with the information noted on these forms, we can process your adjustments requests without delay. Always include a copy of the original bar-coded invoice for quick and accurate processing. 2. Complete instructions are on the back of ArtCarved’s form. Always include exact instructions with the ring. Missing or unclear instructions will delay the processing of your request. 4. Place ring in the envelope and forward in an appropriate mailing container via insured and mail it in. 5. Always note the name of the school and the engraving inside the ring. This will help us to assist you should inquiries be necessary. We can make repairs only on ArtCarved Class Rings only. We cannot repair rings made by other companies. Any change in ring specifications other than the size or year date will require a charge. Please include approval of anticipated charges with your note of instructions. We are not responsible for any class ring repairs if prior repair work has been done outside our factory. Sometimes repair work requested requires a ring be remade to replace the original ring. This will be done at ArtCarved’s discretion, and you will be notified in advance only if a charge involved. If a ring is of sentimental value to a customer, an explicit note directing that the ring not be remade must be included with the ring. Didn't come out right? Well, mistakes happen, but we are committed to fixing it for you. Many times the errors that occur can be repaired. You'll get the ring you want quicker and cheaper if you send it in for a repair. So first, if you didn't know. When you buy from us, you are getting an ArtCarved ring. They are a division of Commemorative Brands, Inc. They've been making rings for over 150 years! They are super cool, and we LOVE their work. Now to the covered repairs. - Any repairs or remakes necessary due to manufacturing errors or defects in quality discovered upon receipt of the ring will be corrected at no charge to the customer. - Resizing is FREE as long as the new size is within 2 ring sizes of the original ring. For example, a size 10 is sent back to be an 8. This resizing is no charge. If sized up or down more than 2 sizes, an $85 remake fee is required. *Remember, your ArtCarved Class Ring full lifetime warranty is not valid if work performed on the ring outside the factory goees beyond our in-store repair program guidelines. Yes. High School rings are available without school names. A special diamond or star-shaped design may be used in place of the school name. The words "High School" may also be used. Yes. 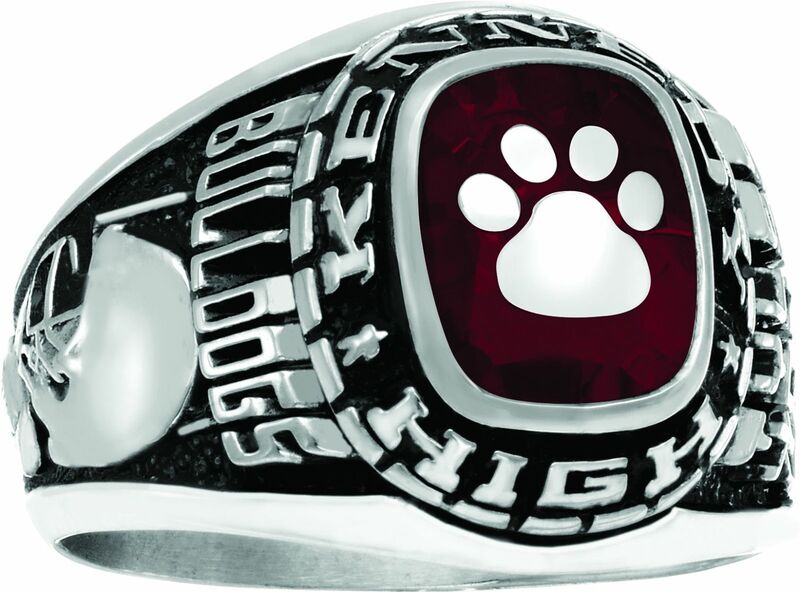 All class rings are available with back year dates for a nominal charge, as long as the school is still in existence. No. We cannot offer you exact replicas or replacements for rings made years ago. However, many of our ring styles have been in production for decades, and all rings are available with BACK DATES for a nominal charge, as long as the school is still in existence. No discrimination here. Some of our favorite people are have been home schooled. We offer the bezel (wording around the stone) option of the following spellouts: "Home School", "Home Education" and "Home School High". We strongly recommend you visit a jeweler for a professional sizing. This will ensure the most accurate size and minimize the chances that you will order incorrectly. Due to size variance between hands, you should decide on which hand and finger the ring will be worn. The ring should easily slide on, but will resist slightly when coming off, even taking 2-3 seconds to get over the knuckle. Fingers have a tendency to swell and/or shrink as much as a 1/2 size depending on time of day, temperature, and after performing certain physical activities. If it initially seems to be a little too large or too small, try wearing it for a few weeks to get used to it before requesting a different size. Remember, different activities and temperatures throughout the day will cause your hands and fingers to constantly change, so it’s normal to have a ring feel tight sometimes and loose other times--often in the same day. Wearing your new ring for a few weeks will help you better determine if a resize is necessary. Yes. If you are an organization looking to raise money through fundraising, then we can help you out. Or, if you are an affiliate who wants to make some cash for yourself, then contact us at info@wearmystory.com.